RouteConverter is a free and portable (no need to install) GPS utility that will download or use on line available (a lot of) maps, to let you monitor, customize and convert routes, waypoints and tracks. You can use this application if you like to plan your routes and consolidate tracks. The program supports more than 81 common GPS file formats, it detects the file format automatically when loading, it takes over routes from Google Maps, it supports metric length, land miles and nautical miles, it allows unlimited undo and redo of changes. RouteConverter is rather easy to use, but be a little patient to let it download the maps it needs, otherwise you may not be able to view your routes. You can zoom as in Google maps. The program lets you cut or copy and paste your waypoints, as well as search to find a location. You can save, export and import information. 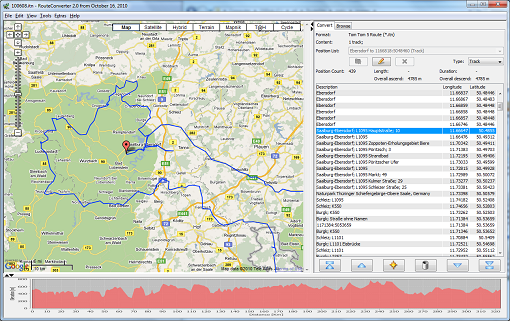 RouteConverter supports GPX, TRK, CSV, KML, TRK, KRT, and simple text format. As you plan your routes you can select to avoid highways or build your route for walking or driving. If you like to plan a route on your PC, regardless of what you can do with your phone, RouteConverter will prove a worthy program; you won’t be disappointed!